Whilst there are often complaints about the inability of government to work as effectively as ‘the marketplace’, we should all be grateful that academia is not in charge of the country; nothing would happen for years on end. As many weeks have also passed since I sent my thesis to the University’s electronic repository, and it still hasn’t appeared online, I have decided to put it online myself. Innovation is widely recognised as essential to the modern economy. The term knowledge-based innovation system has been used to refer to innovation systems which recognise the importance of an economy’s knowledge base and the efficient interactions between important actors from the different sectors of society. Such interactions are thought to enable greater innovation by the system as a whole. Whilst it may not be possible to fully understand all the complex relationships involved within knowledge-based innovation systems, within the field of informetrics bibliometric methodologies have emerged that allows us to analyse some of the relationships that contribute to the innovation process. However, due to the limitations in traditional bibliometric sources it is important to investigate new potential sources of information. The web is one such source. 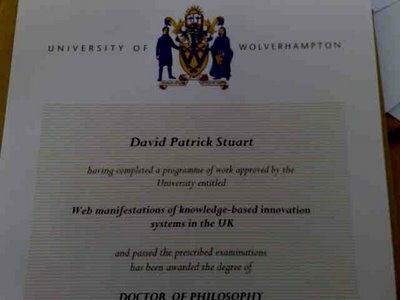 This thesis documents an investigation into the potential of the web to provide information about knowledge-based innovation systems in the United Kingdom. Within this thesis the link analysis methodologies that have previously been successfully applied to investigations of the academic community (Thelwall, 2004a) are applied to organisations from different sections of society to determine whether link analysis of the web can provide a new source of information about knowledge-based innovation systems in the UK. 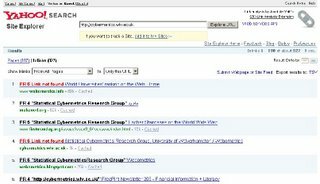 This study makes the case that data may be collected ethically to provide information about the interconnections between web sites of various different sizes and from within different sectors of society, that there are significant differences in the linking practices of web sites within different sectors, and that reciprocal links provide a better indication of collaboration than uni-directional web links. Most importantly the study shows that the web provides new information about the relationships between organisations, rather than just a repetition of the same information from an alternative source. Whilst the study has shown that there is a lot of potential for the web as a source of information on knowledge-based innovation systems, the same richness that makes it such a potentially useful source makes applications of large scale studies very labour intensive. Obviously the above abstract will have all but the greatest dullard champing at the bit, and I have therefore made it available in both PDF and Word Document formats. 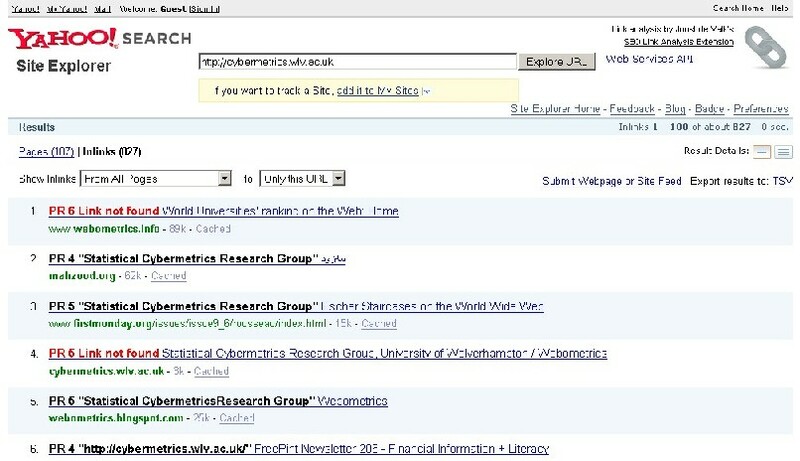 Whilst I hate search engine optimisation, it doesn’t mean that they don’t occassionally come out with some useful tools. Search Engine Roundtable have just brought to my attention a Firefox PlugIn by Joost de Valk which provides a PageRank and the anchor text for each of the inlinks found through either Google Webmaster Tools, Yahoo Site Explorer, and Microsoft Webmaster.